I am not selling my books nor do I have access to the discounted price I originally paid. If you are interested in buying these books, please use Amazon Japan. The books are about $40 each plus shipping. If you email asking where to buy the books or asking to purchase mine, I will not respond. You may have gathered from this blog that I have a love of all things international. Through much hard work and calculation, I have struck up a unique relationship with my counterpart in Japan. So unique, that when Trena went to Tokyo, my counterpart actually took her shopping — and we’ve never met! At anyrate, when this week’s delegation came to Baltimore for three days, with them came four of the five English languageBunka Fashion College textbooks. Ginevra first tipped me off that they were coming and Christina let me know they were out. Oh, BTW, Bunka is pronounce Boon-ka. These look small in the photo, but they are 8×11 size (really A4, but whatev). I am going to do my best not to gush too hard here. But, I am BEYOND excited about these books. Mostly, because they only cost me $100 for the four. They are selling in the states for $44 each. These are definitely text books. But, what I like about them as textbooks is that they, wait for it, ACTUALLY TEACH SEWING. See that below? 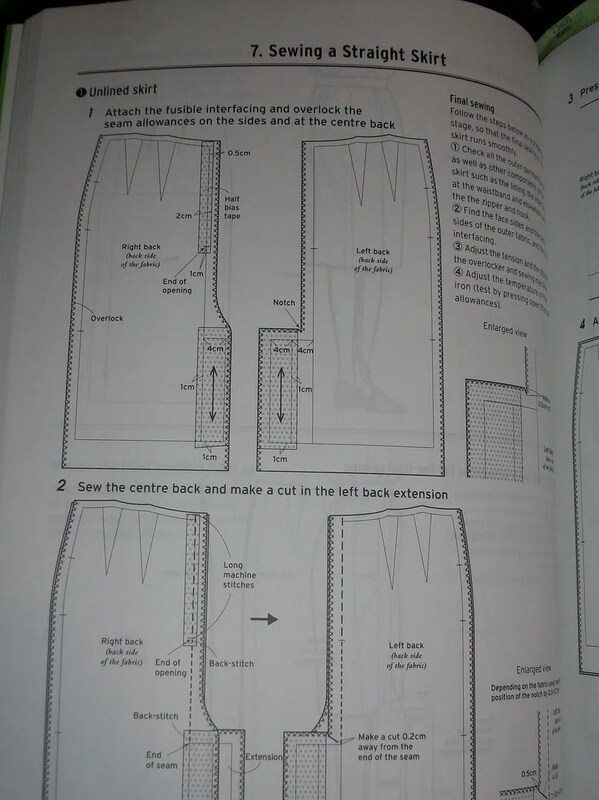 Those are directions on how to sew a skirt, where to add lining, how to sew lining, how to cut it out, ways to pretreat, suggested fabrics for garments, places for interfacing, etc. 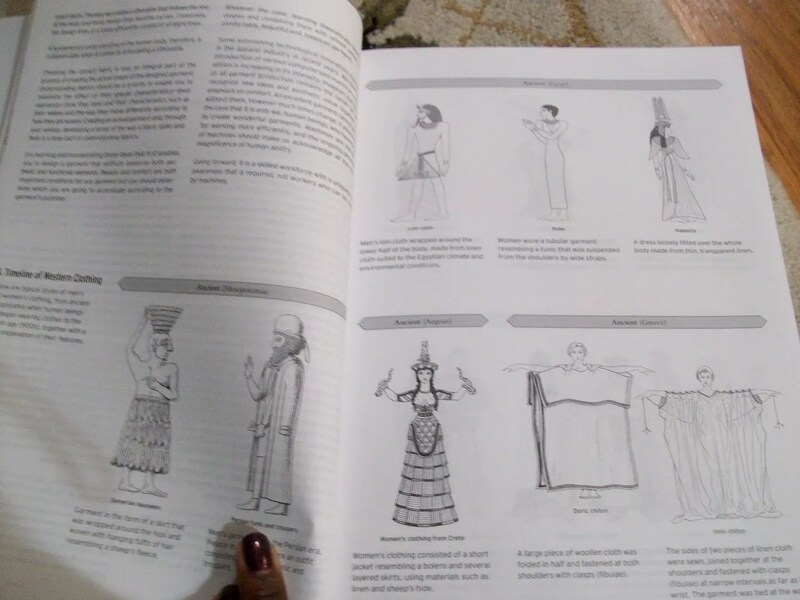 Yes, home sewers have sewing books that teach you this, but I can tell you that my garment design textbook (which cost $100) DOES NOT tell you *how* to sew. And this is all just in ONE BOOK. Of course, there are things I don’t like. First, according to their charts I’m like the LARGEST size possible. After spending four days with six Japanese women, I would agree. I am huge. But, what’s interesting about their sizing charts, is they take AGE into consideration. Now, call me crazy, but I suspect I won’t age like a Japanese woman. But, I do like to know that they take that into consideration in their drafts. The other thing I don’t like, so many new products for me to track down! Mostly a few rulers like the D-curve (which looks like my #6), the reduction ruler, thier sleeve pressing ham (I like that it’s shaped more like an arm than my sleeve roll), and pressing horse. I am resisting their pressing ham, pressing board, handy mat, crossarm and Yukiwari — our tailoring board. Hmm, but I cannot resist the needle board. It might be good I can’t find it on their website. Or this bobbin holder. Someone I know is going back to Japan in March. My plan is to save up, do a huge order and pay the $50 extra luggaage fee on Al Nippon Air! 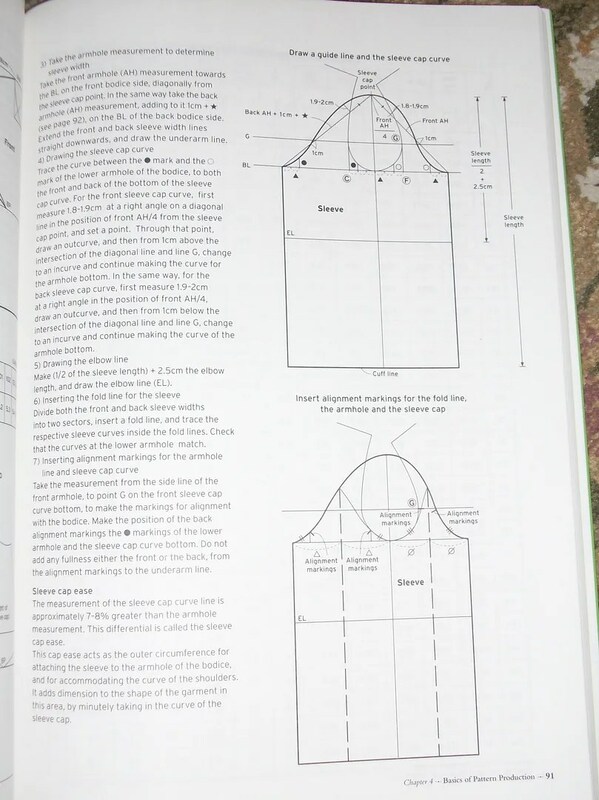 So, to sum up, if you can find at least the first book, Fundamentals of Garment Design, I think it it well worth the money if you are interested in fit and working with the Japanese patterns. If you are interested in drafting on your own, then I would get the remainder. The last, Coats and Capes, comes out in December. And, if you are thinking of ordering from Amazon.com Japan and saving some money. shipping is almost $50 for the four. Now you’ve done it – I need to go to Japan and get these. I especially love the sections on clothing history. And like you I crave all of their obscure tools. So cool! My experience with Japanese pattern books is that they have really great line drawings in the instructions that make the language issue irrelevant. I can only imagine what it would be like to actually be able to read one! Wow! A design book that teaches you how to sew, what a novel concept. Maybe that’s why no one on Project Runways this season can actually sew well. If you are the largest size then I will be way out of the ballpark on this one. My dd, who is small by American standards can never complain to her expat friends in Korea about how hard it is to find clothing that fits. She is a size large in Korean sizes. 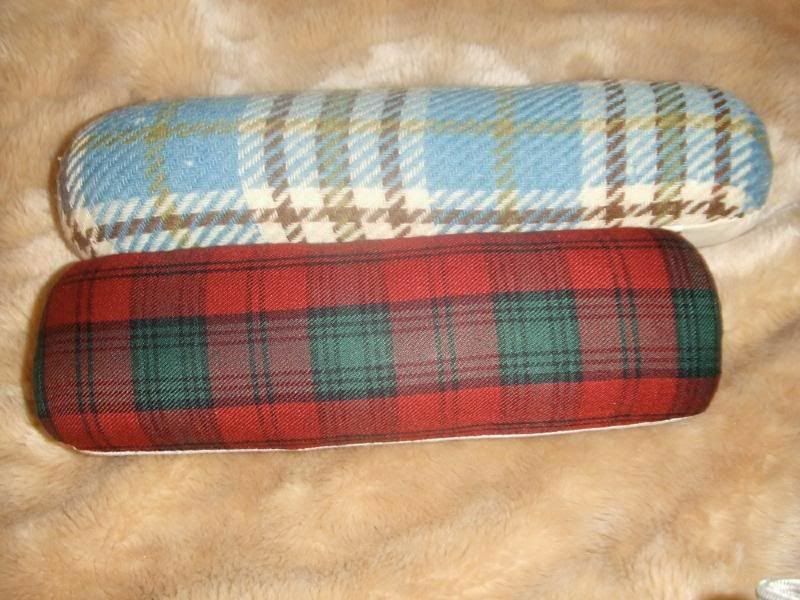 I’ve been sewing for over 50 years, but I WANT!!! I like that sleeve cap diagram… notice how it is nothing like the symmetrical crap found in printed patterns? Yep. That’s the first thing I want to work on. I remember Kathleen Fansenella talking about it several years ago. WOW. Now those look really interesting, I may have to beg you to slip them in your suitcase for Philly next year. I have alot of the Japanese Craft books and I have thought about buying these pattern books also. Can you post some more picture of the patterns inside please. Hi Lisa. They really aren’t pattern books. 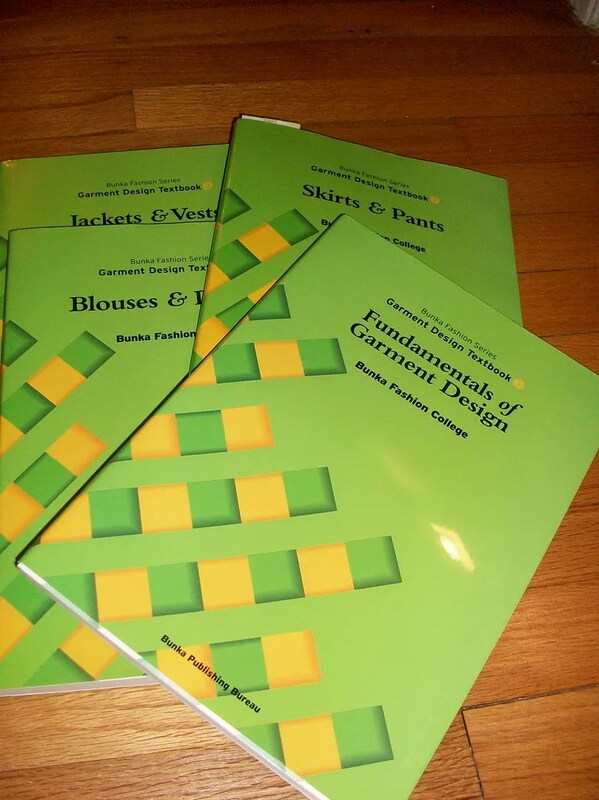 They are garment design drafting books. If you want patterns, do a search here for MSB or Mrs. Stylebook. I want the bobbin holder!!!! Plus, I went onto their website and saw the really cool colored pattern weights. Is there anywhere in the states that these items can be procured? I love the weights too! But, they are $6 each and I easily want 20 of them 😦 I’ve only seen very common Bunka tools like seam rippers etc available in the US. I was bought a Mrs Stylebook for my birthday and have been hankering after the Bunka books since then, but have talked myself into not needing them. Now here you are with this fabulous review and all my good work is undone. I simply have to have these. Good job Christmas is right around the corner!!!! Cool books! Maybe I’ll add them to my to-buy list. Your “I’m huge” comment reminds me of my one and only trip to Japan. I worked in finance in New York, and went to the Tokyo office on business. The women in the Tokyo office dressed much more fashionably than in New York, so I figured that I’d go out and buy a new outfit while there to wear to the office. I went shopping on the Ginza, and everything was too small. So then I felt unfashionable and fat. I read your post yesterday and share your enthusiasm for Japanese pattern and sewing books. I was at a quilt show today in New Hampshire and several vendors had the bobbin holder you linked to. It is the same but the colors are green and yellow. It is made in Japan, distributed by Clover Needlecraft in the USA and is called a Stack ‘n Store Bobbin Tower. It must be new here, I never saw one before today. Based on the number of vendors who had them, I suspect you will find them around. Those books are very interesting because they show the pattern draft as well as the sewing directions. I have never seen such a book. About the pressing tools I know that a lot of tailors use such tools and if you google you can find directions how to make them yourself just use steam beech wood. Wow, those books look great! Thank you for sharing! That bobbin holder is so nifty!!! Find one here in the US and let us know about it!! You can get those bobbin holders in the States! If you look on e-bay, Nancy Zeiman sells them for $13.95. There are several other vendors, so I am just about to place an order. I have had a needle board for years and it is very expensive, for a very small object! Steinloff and Stoller will have one if you want to get it on your next trip to NYC. You can also buy a piece of mohair velvet to use. But really this is only used for velvet, so if you aren’t planning on sewing with velvet, you’d be better off getting some of the tailoring forms. My dh made me one like the Yukiwari. I just saw this series of books for sale at Kinokuniya in NYC (store is across from Bryant Park on 6th Ave). At 5’7″, I don’t think many of these patterns would work for me – but your blog entry may have convinced me to buy them anyway, just for the instructions. I’d pay the $44 each for these! I’ve been coveting these books at my local Kinokuniya and hopefully they’ll turn up in my Christmas stocking. I was wondering though, do you need any of the special tools to do the pattern drafting? I have french curves and hip curves for I guess “normal” pattern drafting – will these do without much modification? Hi! It’s only me? when I click the links you give for the Bunka items, it directs me to http://www.bunka-koubai.com/, but it’s all in Japanese. Where can I click in the site to write in english? I am really interested in a Bunka mannequin for sewing, but I don’t know how much it costs ’cause I don’t understand Japanese at all. About the books you can also buy them from here: http://www.yesasia.com/global/garment-design-textbook-1-fundamentals-of-garment-design-english/1020278579-0-0-0-en/info.html and, at least, if you’re from Europe the shipping it’s free and it only takes 2 weeks. Thank you and happy winter hollidays! This is a great blog! I’ve just discovered these books and have now just ordered some on the above site. How exciting!!! I even found some of them on ebay. thanks for the great pictures and the sharing of your wild enthusiasm! Hayes Sewing in Wilmington, DE sells the identical Zieman bobbin holders (except in green, so I guess they aren’t exactly “identical”). I mail order all the time from them (only “local” source of Kwik Sew patterns) by phone, and they are fast and accurate. I use the silicon bobbin rings, which are tons more practical and also have the advantage of being able to hang on my pegboard, but every time I’m at Hayes I still fight the urge to buy the Zieman one, just because it’s so cool! If you ever have the opportunity to order more of these, please let me know. Does anyone know if the bunka pattern drafting books discuss menswear as well? I would need a men’s jacket only to compare pattern drafting systems from different countries. I don’t know if the “jackets and vests” book includes menswear or not…. Cidell, are you still planning to have someone bring back the items from Japan in March? I’d like to place an order. Hi dear! I’m not too sure if you still need the Bunka textbooks, but I have two brand new ones for sale (Skirts & Pants and Jackets & Vest). Am willing to sell it at a cheaper price! Please email me or text me at 91250428. I’m based in Singapore btw! 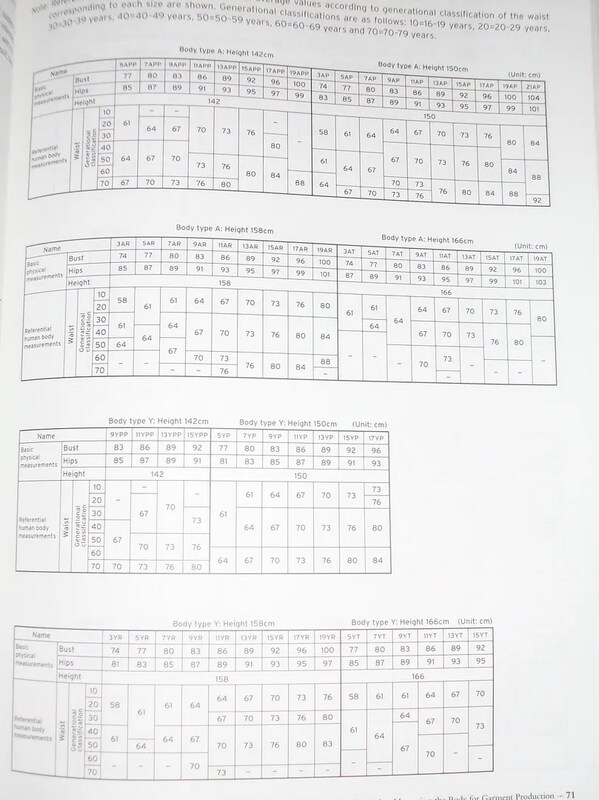 At the moment I am doing my bachelor exam, and I am writing about the differences between asian and european body shapes, Here I am comparing measurement charts and patterns with each other to be able to find out what I am supposed to adjust according to the 2 different export markets. In this process, I have been using my danish construction books, both for the european body and the japanese body. I am not really abble to make it look proportional. At school we are using a pattern book from Japan, called Pattern Magic, so I looked at a basic block pattern to see if i could find out hom to make it look better, no succes! I therefore googled Bunka style trouser block, and that brought me here. I would like to buy all the books, which I definatly will do, but I am not sure if they will reach me in denmark before i have to hand in. I therefore wanted to hear, if i could buy the recepie of the basic trouser block from you, so i will be abble to continue for now? If I understand your question correctly, there is no ‘block’. I believe they have you do an actual draft with measurements. 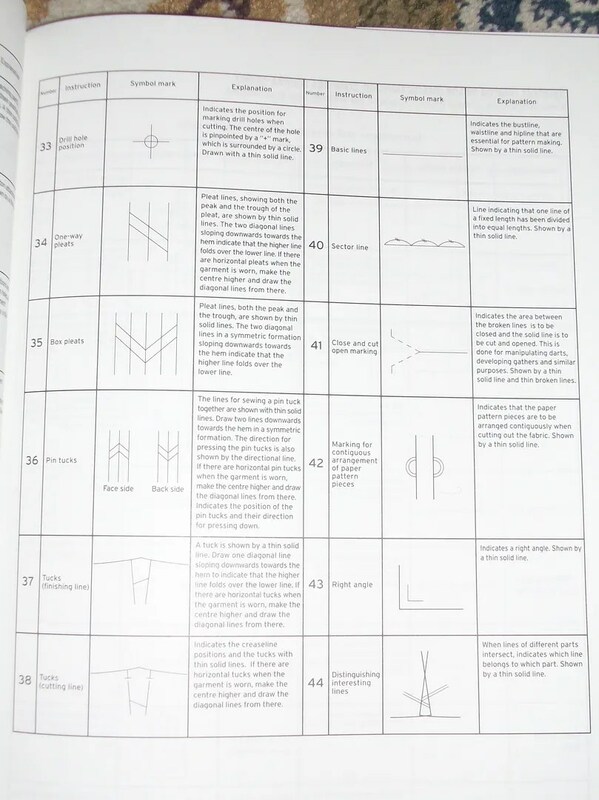 i agree, the Bunka books are good, especially for pattern drafting. I have purchased them as they were published from sources of Japanese publications. The sewing instructions are basic, but well illustrated. 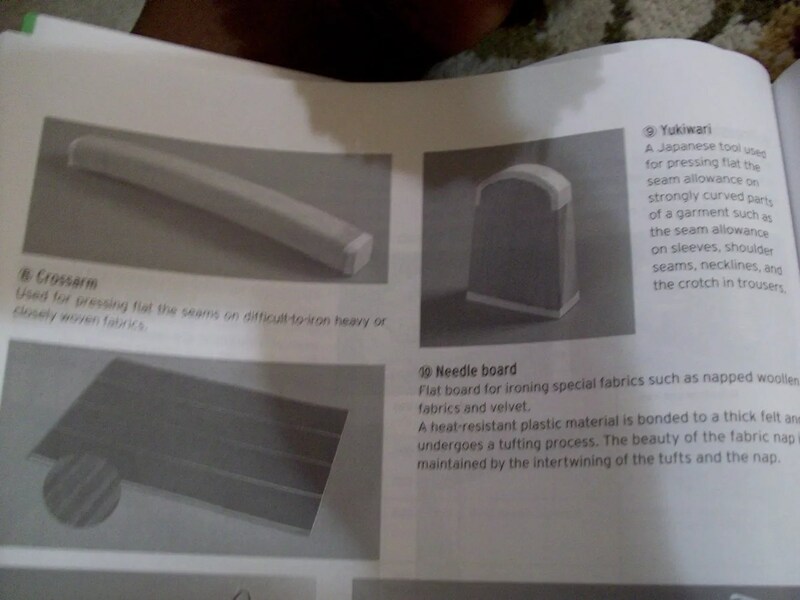 I am new to drafting and recently bought the 3rd bunka book. It has the bodice sloper instructions at the back. I cannot buy all the books at once, so I am buying one by one. 3rd book seemed to be a wise choice :). So, I am trying to decide which one to buy next. I stumbled upon your blog while looking for the bunka book reviews. Would it be possible for you to let me know a few things about the books? It would be really very helpful for me. What I am looking for is which one has skirt sloper and sleeve sloper? Any suggestion on which book you think would be better to buy next would be very much appreciated. Hello! I’ve been following your web site for a long time now and finally got the bravery to go ahead and give you a shout out from Humble Texas! Just wanted to mention keep up the good work! for products and services before you are allowed to proceed. can start with secured credit cards like those offered by Capital One, that required a security deposit.